Research papers on Frederick Herzberg look into the American psychologist whose work became highly influential in business management. Frederick Herzberg (1923-2000) was an American psychologist whose work became highly influential in business management, largely through his 1968 article “One More Time, How Do You Motivate Employees?” which originally appeared in the Harvard Business Review. 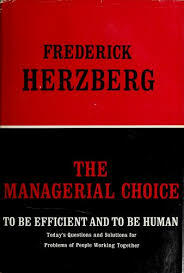 Herzberg is also remembered for the Motivator-Hygiene Theory, also known as the Two-factor theory, regarding job satisfaction. Frederick Herzberg was born in Lynn, Massachusetts, the son of Lithuanian immigrants. In 1939, he entered City College of New York, but left before completing his studies in order to enlist in the US Army during World War II. After the war, he returned to City College, completing his degree in 1946 and then moving to the University of Pittsburgh, where he earned both his Master’s and Doctoral degrees. His thesis work focused on electric shock therapy. Starting in the 1950s, Herzberg worked at the University of Utah, where he began research on organizations and organizational behavior. It was through this work that he developed the Motivator-Hygiene Theory, also known as the Two-factor theory, or simply the Herzberg Theory. This states that people are influenced by two sets of factors. Hygiene factors include status, salary, fringe benefits, and job security, which do not lead towards higher satisfaction, but the absence of which will lead to dissatisfaction. Motivators include recognition, and responsibility, things that do provide satisfaction. Theory of Work Research Papers examine a paper ordered on a specific theory of group interaction and development. Educational Psychology Theories - The father of humanism, Abraham Maslow is the primary source for this aspect of educational psychology, with his hierarchy of needs pyramid. Human Motivation - Research papers explain the role of learning in Human Motivation, and 5 theories that provide pros and cons regarding risk-taking in human motivation. What is a Need research papers look at the Maslow hypothesis of the human need hierarchy. Theory of Motivation Research Papers look at an example of a paper order that already gives you an outline to follow. Order a research paper on Theory of Motivation from Paper Masters. Maslow's Hierarchy - Maslow’s Hierarchy research papers examine the theory, developed by Abraham Maslow, in which human development is laid out along a hierarchy, from the most basic to the more psychologically advanced needs of a person. Alfred Adler (1870-1937) was a close associate of Freud’s until his split, becoming an adversary whose theory was the antithesis of Freud’s. Performance Evaluation System research papers discuss individual task outcomes of employee and how well he/she completes their specific job requirements. Leadership in Human Resources Research Papers discuss a paper ordered on an interview on what they understand about Human Resources responsibilities. In Maslow's Hierarchy of Needs research papers, Maslow's theory is discussed in light of employee motivation. Equity Theory research papers explore employee motivation theories in custom college research papers. Lockheed Martin Aeronautics - Lockheed Martin Aeronautics Research Papers examine how this company is developing a feasible, effective motivation plan. Employee Empowerment - Employee Empowerment research focuses on ways to create effective employee empowerment and motivation in any organization. Expectancy Theory research papers discuss employee motivation and are custom written research term papers. Teamwork - Teamwork is a practice that is growing in many industries to increase worker participation, which also raises employee motivation. Labor/Employee Relations - Labor/Employee Relations research papers take a vast amount of time to outline and write. The 7 Habits of Highly Effective People - How does one get the motivation to strive to be the best person he or she can be ? Subjective Well Being - Maslow's Hierarchy of Needs research papers discuss Maslow's theory in light of employee motivation. Self-Esteem - Self-Esteem essays discuss the factors that encourage high levels of self-esteem in young adults. Employment Discrimination - Employment Discrimination laws protect employees and keep employers in line when opportunities such as promotions, pay increases, career advancement and basic hiring opportunities become available. Managerial Applications - In current news there are several subjects that may have an effect on the level of motivation in today's global organizations. Application of Leadership Principles - An Application of Leadership Principles is an analysis of work situations that involve leadership. Total Quality Management - Total Quality Management s a conceptual term for driving the highest quality through the total development process and life cycle of a product. Paper Masters writes custom research papers on Frederick Herzberg look into the American psychologist whose work became highly influential in business management.